Monasteries of sikkim, sikkim monasteries . Mahaguru Padmasambhava, also called Guru Rinpoche, who was the restorer of Buddhism in Tibet, and the main exponent of Tantric form of Buddhism, had prophesied during his visit to Tibet in the 8th Century A.D. that amongst the holy hidden lands or sBESgNES, which was personally consecrated by him, BES-YUL Dremojong (Sikkim), was the holiest. Here he had hidden a vast religious treasure, including holy books to be discovered and interpreted, in future, by great saints. It was the fulfillment of this prophecy when Lhatsun Namkha Jigme or Lhatsun Chempo, Kathok Rikzin Chempo and Nagadak Sampa Chempo (the Yuksam) came to Sikkim to propagate Buddhism and set the history of the rNal-jor Ched-Shi. the Fire-Bird year of the 10th of the sixty year cycles corresponding to 1597 A.D. He came to Sikkim from the north direction via Dzongri to Norbugang. In Sikkim, he was received by the Lepcha Chief Thekung Mensalong, the consecrated host. Kathok Rikzin Kuntu Zangpo came from the west direction and Ngakak Sempa Rikzin Phuntsog came from the south direction. All the three of them met at Norbugang which was then called by the Lepchas as YUKSAM, meaning the three superior ones or literally meaning ''the three lamas'. These three lamas invited Phuntsog Namgyal from the east direction, and consecrated him as the first Chogyal of Sikkim in 1642 A.D, at Yuksam, where the stone throne of these four brothers, known as rNal-Jor Ched-Shi, can be seen even today. Lhatsun Chempo was largely responsible for consolidating Buddhism in Sikkim. He first built Dubdi Monastery near Yuksam. Later, he build shrines at Sa-nga-choe-ling and Pemayangtse. He spent his years in Sikkim mostly exploring caves, mountain recesses and holy places, composing, Buddhist legends and selecting sites for shrines, chortens (stupas) and monasteries. After his death, his personal effects were carefully treasured and worshipped by the Sikkimese as religious objects. By the time of his death, Buddhism had steadily progressed in Sikkim and the monasteries then belonged to Nyingma order and its sub sects. It was during and subsequent to the reign of the fourth Chogyal Gyurmed Namgyal that the first Kagyu monastery came into existence. Since then many large and small monasteries belonging to the two sects have been build influencing the cultural heritage and lifestyle of the people. Duddul Chorten at Dotapu Chorten, Gangtok was built under the supervision of the late Most Venerable Trulshi Rinpoche after due preparations in 1945-46, in accordance with the prophecy made in 1944 by His Holiness the Dud-Zom Rinpoche. Placed inside the Chorten are a complete mandala set of Dorji Phurpa (Bajra Kilaya), one set of Ka-gyur Holy Books, relics, complete 'zung[ (mantras) and other religious objects. 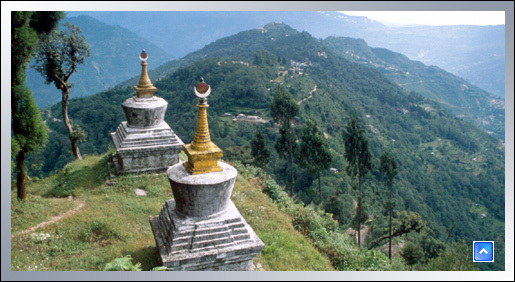 This Chorten is considered to be one of the most important chortens of Sikkim. Around the Chorten is installed 108 Mani-Lhakor (Prayer Wheels), The Chorten is surrounded by Chorten Lhakhang, Guru Lhakhang, where two huge statues of Guru Rinpoche (Guru Padmasambhava) are installed, Drupda (Meditation Centre), Nyingma Sheda (Institute of Nyingma Higher Studies) and many smaller monuments including the 'kudung' of the late Most Venerable Trulshi Rinpoche. 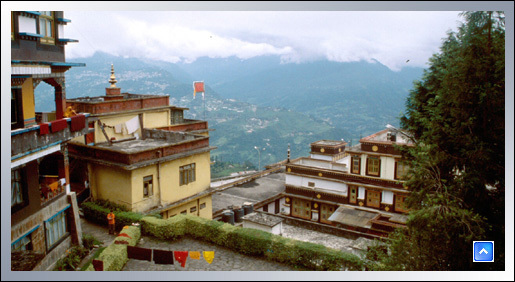 The Sikkim Research Institute of Tibetology and other Buddhist Studies (SRITOBS) is located near the Chorten. His Eminence Dodrup Chen Rinpoche of Sikkim has His seat at the Chorten Lhakhang and guides the disciples, including the inmates of the Drubda, in their search for higher knowledge and practice of the tenets of the Nyingma Order. Pemayangtse is situated in West Sikkim at Gyalshing (140 Kms from Gangtok) and commands an impressive view of Mount Khangchendzonga. It was originally a small Lhakhang built by Lhatsun Chempo in the 17th Century. Later during the rule of the third Chogyal Chakdor Namgyal, Lhatsun Chempo's third reincarnate Jigme Pawo extended it and rebuilt the structure. This monastery belongs to the Nyingma order and all other Nyingma monasteries in Sikkim are subordinate to it. The monks of Pemayangtse are usually from the leading Bhutia families in Sikkim. There are 108 monks in this monastery. The monastery houses numerous religious idols and other objects of worship, most of which are precious because of their antiquity. On the top floor of the monastery there is a wooden sculpture depicting the Mahaguru's Heavenly Palace 'Sangthokpalri'. This masterpiece was completed by the late Dungzin Rimpoche, who took 5 years to craft it single handed. The main festival of the monastery is on the 28th and 29th day of the 12th month of the Tibetan Calendar, normally corresponding to the month of February. During these two days religious dances are performed and pilgrims come from all over Sikkim to watch them. This monastery in North Sikkim is 28 kms from Gangtok. The original monastery has been rebuilt and is today one of the most beautiful monasteries in Sikkim. It possesses the old mural paintings and has around 260 monks. Like Ralong and Rumtek the main annual Puja is performed on the 28th and 29th days of the tenth month of the Tibetan Calendar when the religious dances are performed. the Dharma Chakra Centre nearby. The annual dances are held on the 28th and 29th day of the tenth month of the Tibetan Calendar. Lama Drupthob Karpo is supposed to have built a small hermitage at the spot he reached after he flew from Maynam Hill in South Sikkim. Later during the reign of Sidyong Tulku 1909 - 1910 the present monastery was built in the shape of a Chinese pagoda. The monastery follows the Nyingma Order and has around 90 monks. The annual puja is celebrated with dances on the 18th and 19th days of the twelfth month of the Tibetan Calendar which normally corresponds to the month of January. The monastery was damaged by an earthquake in 1980 and with Government aid has recently been renovated. This monastery was built in 1721 during the time of Jigme Pawo. In 1947 it was completely gutted by a devastating fire. However it was rebuilt in 1948 thanks largely to the devotion of the lamas and the unstinted support of the laity. There are around 300 monks under the monastery and main annual function in the monastery is on the 28th and 29th days of the tenth month of the Tibetan calendar which normally corresponds to the month of December. The fourth Chogyal of Sikkim, who was born in 1710, disguised himself as a common man and proceeded on a pilgrimage to Tibet. When he reached Tsurphu, the seat of His Holiness Gyalwa Karmapa- The Karmapa recognized the Chogyal and accorded him the royal welcome commensurate with his position. The Chogyal in turn promised that on his return to Sikkim he would build Kagyupa monasteries and so were built Karma Rabtenling monastery in Ralong, Karma Thupten Chokhorling monastery in Rumtek and Karma Tashi Chokhorling monastery in Phodang. 17th Century. The main monastery was built by Pedi Wangmo during the reign of Chakdor Namgyal and some of the statuses built then still exist. 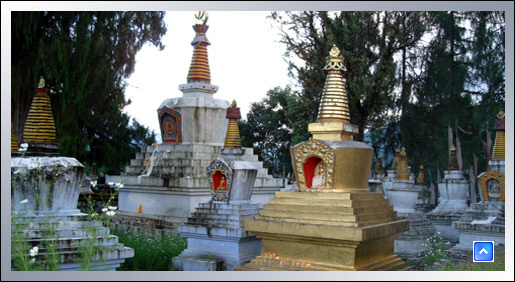 The sacred objects of worship in Tashiding are the chorten Thongwa Rangdol and Bumchu (holy water). The chorten was built by Lhatsun Chempo and it is believed that merely to view the chorten is enough to cleanse one of all sins. Bumchu is a sacred pot containing holy water blessed by Nagadak Sempa Chempo, after he had performed the Mane Mantra prayers 5 billion times. The holy water does not dry up nor spoil and continues to have the fresh smell even 300 years. Later. The sacred Bumpa containing the water is kept under seal and opened for public darshan once a year on the 15th day of the first Tibetan month. The monastery houses about 60 monks and belongs to the Nyingma Order.